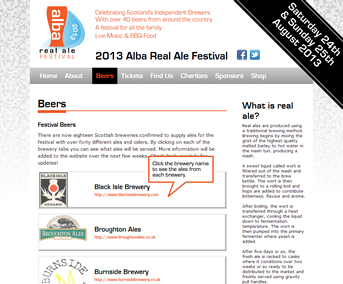 The Royal Tay Yacht club had plans to run a fund raising beer festival in 2012 and approached us in need of a website, a logo and help creating advertisements that would appear in local publications. They were keen to avoid the stereotypical image associated with beer festivals and wanted something that would appeal to families and younger drinkers as well as real ale aficionados. We worked with them to design a logo that was suitable for use online and in colour or black & white on their printed matter + merchandise. 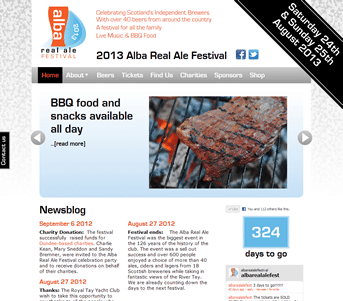 The site had to be easy to update and we provided front page “features” on a carousel, a gallery, a newsblog, a brewer & beer database and a sponsor page that could all be updated by them as the festival took shape. With links to Twitter and Facebook integration on the pages, their “joined up” marketing efforts were rewarded and the inaugural festival was a big success, with tickets selling out a month before the festival was held. They plan to build on their success in 2013, updating the site as they go. The structured nature of the site means that they will be able to leverage the work they have put in building up their beer database, sponsor list and gallery to make preparing for 2013 an easier task.